Go, go, go! 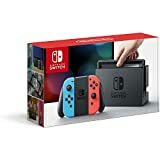 We can’t even remember the last time the Nintendo Switch with Neon Blue and Neon Red Joy-Con was in stock on Amazon, but it’s in stock RIGHT NOW at MSRP. That means you have a chance to buy it without having to pay a premium, and it’ll be delivered to your door in two days with free Prime shipping. There’s no way stock will last long, so hurry!